Morro Bay, CA — My oh my, how passions can drive us! There are two kinds, as we know, good passions and evil ones. Bill playing a tune for a very unusual shopper–read about him in my story. My new friend William Alpert has a passion that drives him. A beautiful one. It’s music. More than that, it’s making music. More than that, it’s making music with his violin. And as a concert violinist. Those close to me say I have such a driving passion. They are right. It’s writing. More than that, it’s writing words that others might enjoy. Would you believe? That Bill—he prefers Bill—fell in love with the violin when he was in the sixth grade—only 11. And he’s just made it into Social Security and he is still fiddling. Hey, I’d bet he plays seven days a week. He’s told me amazing things. One really made me marvel — he’s been playing the same violin for 31 years. The very one he was playing when I first met him two weeks ago. He had held it out proudly for me to look over. I know zilch about violins. He said, “It’s a Caressa. Made in France in 1901. Very, very good!” I put in that exclamation mark because that’s the way he said it. Imagine, a violin more than a century old. Well, Bill didn’t say this, but I believe if a fire came up at home, his Caressa would be the first thing he’d try and save. He’d dash out with it in one hand and his wife Melanie in the other. They’ve been married for 40 years. She’s a musician, too. That’s one reason they fell in love. I’ll tell you about her in a minute. That first meeting of ours was in front of Albertsons. It’s our biggest supermarket. Bill was playing his Caressa there. Yes, playing as a young up-and-hopeful sidewalk fiddler, mind you. But with a music stand set up and a stack of music on it. 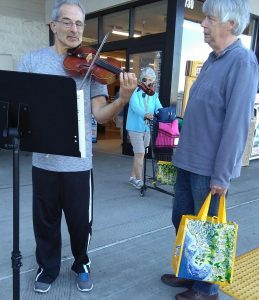 And he had his violin case open on the sidewalk, ready for shoppers to toss in a buck or two in appreciation. And he had just told me he plays in the San Luis Obispo Symphony. That’s the big orchestra here. The symphony player and the sidewalk fiddler — so interesting! Here’s how we met. I have a trike—you know, a tricycle. I’ve been a bike rider all my life. Ten years ago I took a bad spill and quit. Then I discovered the trike, lucky me. It’s much safer. It’s now my main way to exercise. Besides, it’s so practical, with baskets front and rear. And such good fun. I use it every day. I can go a week without driving my car. I shop at Albertsons. It butts up against a big Rite-Aid. They are side by side in the same sprawling building. Rite-Aid is big but Albertsons is bigger. I live nearby. The huge parking lot in front of the two has become my exercise yard. It has 10 big driveways leading up to it. Cars park nose-in on both sides. I pedal up and down those driveways, from far left to far right, and then do them all again, and then once more. I put in half hour or so. I’m sure some consider it odd. It’s surprising how many customers recognize me – “that old gent on the trike!” Some smile. Give me a little wave. Even ask about my trike. I get to see a lot of interesting goings-on. One day I spotted this fellow fiddling in front of the two stores. He was new to me. He was right between the two, hoping to attract customers from both. Rite-Aid has one front entrance and Albertsons has two. He was so far from those entrances that he attracted practically nobody. Oh, well, I thought. On another day, I spotted him again. Playing on the same spot. I felt bad for him. Pedaled up close, listened to him play for a minute — serious music, quite beautiful — and pitched a dollar into his open case. And pedaled off. The next time he showed up, I rode up to him again. He recognized me and nodded while continuing to fiddle. When he paused to change to a different piece of music, I said, “Hello. I like the way you play.” He smiled and thanked me. We chatted a bit. He is a pro. No doubt about it. He looks like a pro. He plays like a pro. His music says he’s a pro. His white hair and goatee make him look, what shall I say, professorial. It turns out he does teach. Sets up his music stand every time. Puts his music on it. Will play 30 pieces or so in his two-hour gig. Selections from the great composers–Bach, Handel, Beethoven and Mozart. Showpieces from Kreisler and Paganini. Even the occasional Cole Porter standard. Sometimes he plays a piece for practice. He’s going to play it on the concert stage and wants to work out the bugs beforehand. Makes sense. He shows up two or three afternoons a week. Standing and playing there on the concrete sidewalk for two hours takes stamina. Not a problem. He’s lean. Looks like an athlete—a runner maybe? Which he did, again reluctantly. I didn’t let up. “Shift five or six feet more! Closer to the entrance!” Which he did. “One more suggestion, if I may.” I expected he might tell me to buzz off. But he listened, again being nice about it. “Bill, when people approach, look up a bit as you play. Look at them. Smile a little. Hey, your take-home may be better.” He chuckled but nodded. “Great!” I said and pedaled off. I saw him again on another day. But gosh, he was much farther back from where I had put him. I pedaled up. He lowered his violin and smiled a bit. He was embarrassed. I was astounded. But it was so. One thing I’ve noticed. Sometimes he plays with zero customers around. But he plays as if half a dozen were listening and sizing him up. I liked that. One day I was taking pictures of him and a man was entering Albertsons. An older man. He listened a bit, then stood closer, and really listened. I could see he liked what he was hearing. It turned out that he was a professional musician. In fact, a composer (and big-newspaper journalist) — Mark Abel from Cambria, a few miles north. Do check him out at www.markabelmusic.com. 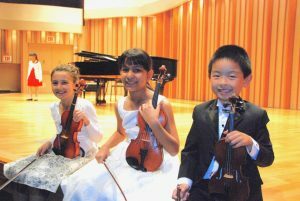 Bill instructs at any age– was proud of these young virtuosi at a graduation concert. and Violin.” He teaches violin and I saw that he is a member of the Suzuki Association of the Americas and American String Teachers Association. His wife Melanie handles the voice part. 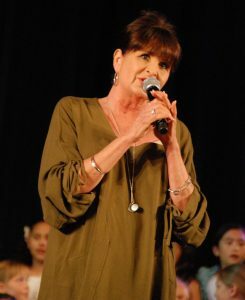 She’s a former opera singer and an active member of the National Association of Teachers of Singing (NATS). I liked their website and enjoyed reading about their teaching philosophy. It seems practical and effective. He and wife Melanie are a team. Here she directs a choral concert. plot!” He chuckled. They’ve been married 40 years. After they graduated and wed, Bill found that earning a living as a young pro was challenging. He went into a family printing and advertising business, and continued to perform and study the violin during increasingly rare spare moments. But never stopped. During that time, he auditioned and won a position in a professional orchestra, the Redlands Symphony in the Los Angeles area. It was a position he held for 30 years until moving to our Central Coast. He plays in several groups. I was surprised that they’ve been in Morro Bay only since 2014. They quickly opened a new teaching studio out of their home on Yerba Buena Street and both teach actively, as they had for many years in the Los Angeles area. Their son Brandon recently moved to Paso Robles a few miles from here. He told me Brandon and his newlywed wife Lauren are both gifted, professional level performers in musical theater and acting. Bill from his long-time teaching insists that anyone with the desire can develop musically. “That just isn’t so,” I told him. As a little kid, I took violin lessons. I felt I did my best. My teacher threw her hands up. In seventh grade we were all tested for the school band. I flunked. Oh, a bit later I also took piano lessons because a teacher told my mom of course I could learn to play. It was all a total waste, to the great chagrin of my dear mom. And my chagrin, too, I do admit. I have a totally tin ear. Sadly, there’s no pill, no therapy, no encouragement that will cure it. Yet I listen to music a lot. Always have nice music on at home, even as I work at my desk. Just can’t make music. Bill was so convinced that anybody can learn that ater I wondered … might I finally have succeeded in playing a tune or two if he had coached me? Maybe, maybe ….. Anyway, there’s no doubt about it. A passion can drive a person to do impressive things. Bill is a clear example. For sure Melanie is passionate about her singing, too. I’ll bet their musicality is the core of their compatibility. I believe Bill will keep fiddling right through his old, old age. And on his Caressa. Well, I’m in my old, old age and as I told you, I still feel a passion. It’s sitting at my keyboard and writing things like this. Bill is happy with his passion and so am I. How fortunate we are. I hope the same can be said for you. Again, my readers, I look forward to hearing from you. I assure you I read your comments, whether you’re enthusiastic or less than. Your comments are my only payback. I’m even happier when you include a bit about yourself. Send me a few words right now, please. Either johnguylaplante@yahoo or @gmail will do the job. If you’re new to my work, go to www.johnguylaplante.com. Right there at the bottom of my home page, you will see the archive of my posts. Glance at them. Click on any one that appeals and it will open fully.